350 Crankshaft Horsepower - PPT is your source for Mercruiser Marine Engines. 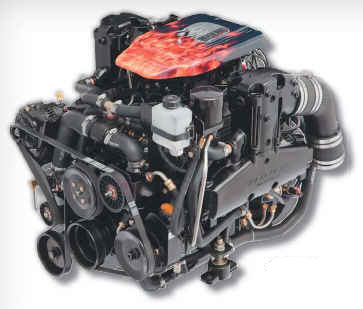 The PLUS SERIES Mercruiser 383 Mag Stroker Marine Engines utilize a completely factory remanufactured longblock in combination with all new accessories. This is the perfect combination due to the latest EPA regulations that require customers looking to repower an existing boat, to either use a new engine equipped with catalyst controls, or use one of these remanufactured PLUS SERIES product options. Select This Link to Read More....Remanufacturing Processes. It's been 10 years since the 454 Gen VI was in standard production and over two decades since the venerable 7.4L Mark IV was installed in tens of thousands of boats in the 1980's. Parts for these engines are scarce and an affordable small block just hasn't had the same torque to get these heavier boats on plane. Now there is an affordable contender that is a drop-in replacement with MORE torque than the Mercruiser 454 Mag Bravo Carbureted Engine offered. Due the 383 Mag's size, being 150 lighter and offering a Full Roller Valvetrain this is the ideal replacement engine for 350 MAG, 7.4L, and 7.4L MPI engines that power cruisers, small boats and large runabouts. > Click here to go to the shim kit that is necessary to mount all new Mercruiser bobtail engines. > 1-Year Factory Warranty or Optional 2 Additional Years of Coverage Available. > For Hawaii, Alaska, or international shipping prices, please call. > Specifications and prices are subject to change without notice.